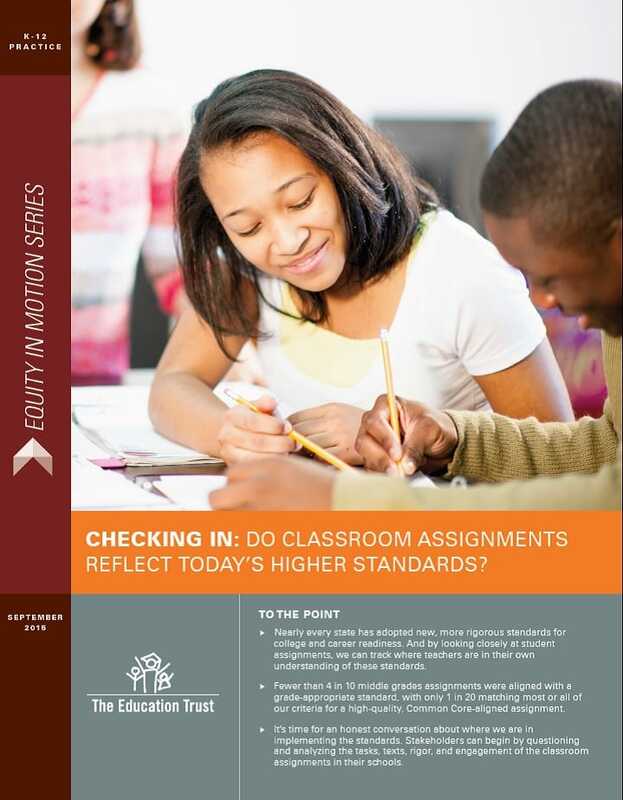 Prepared for school district and education leaders, “Checking In” is the first in our Equity in Motion series, which will scrutinize how issues of equity are translating into the daily activities of schools and educators. Sonja Brookins Santelises, vice president of K-12 policy and practice, The Education Trust. There have been several notable efforts recently to determine whether textbooks are aligned to the Common Core State Standards—most of which have had fairly negative findings. A new report looks at whether individual classroom assignments meet the common-core criteria for literacy. And it, too, finds that alignment, for the most part, is lacking. The Common Core State Standards that most states have adopted have triggered plenty of political debate. But have they transformed how teachers are teaching — and what students are learning? Not nearly enough, according to Education Trust, a nonprofit dedicated to closing achievement gaps.